When launching an application, a boost every developer aims for is the Store provided featuring. This helps customers find the application with ease for the duration of the feature slot and helps increase its chances of success. While everyone grits their teeth at a prominent Games tab slot when pitching for a feature, there are a number of factors which contribute to whether or not it will be granted like: a good relationship with the platform, the IP, game production quality, entertainment value and even the narrative behind it. However, a consistent factor in this is using the platform\OS provided features and ensuring new device compatibility. Both Apple and Google will always try to promote their representative attributes or newer devices, and a good method of doing that is encouraging developers to make use of them in their products. Not only that, they have to be up to par with Apple\Google standards. How does Compliance Fit in all this? TL:DR: In short, the main role Compliance plays is to make sure guidelines\requirements imposed by Apple or Google are met. This ensures applications pass submission review without concerns being raised and Features are granted without last minute fixes being needed. While Google may not have a standardized review process for regular updates as Apple does, they are more rigorous when it comes to reviews in context of a Feature. Be it from the Resolution Center rejected status or that Google Play review issue report, finding out you have to make several potentially difficult fixes in one or two days is never fun. I know…as you’re working on getting your final build ready, you don’t really want to think about an icon not being just right or X permission in the app manifest. While your priorities may be different in that situation, tackling applicable Store requirements ahead of time is very important. Below you can find the most common issues we’ve encountered at flaregames. They do not represent an exhaustive list of all requirements. The Google issues were all reported during feature reviews. The Apple issues were encountered during regular reviews. 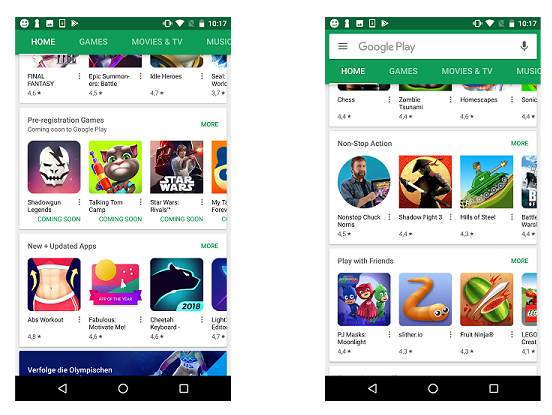 An integral aspect of the user experience on Android are Google Play Game Services. Adding the authentication flow correctly should come first. Sign-in flow is triggered after the user manually signs out via the Achievements Settings screen. The expectation is that an app signs-in a user automatically at launch. 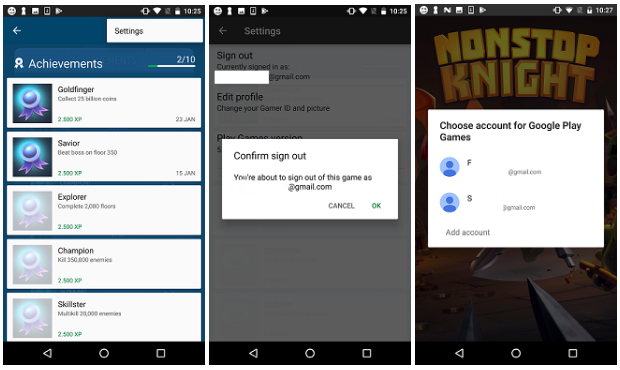 However, if the user has previously signed out, the app should not invoke the sign-in flow automatically. In the example above, the sign-in flow was triggered after signing out from the Achievements UI. The recommendation here is to make sure authentication works correctly in all scenarios, even edge cases. An increase we have noticed over the past year are localization issues. Although the most we’ve seen internally are around the Store listing, the client should not be overlooked. The images under “screenshots” in your Google Play listing does not provide any localized versions. Consider localising for key languages. Recommended examples: French, German, Italian Spanish, Russian, Chinese (trad.) & (simpl. ), Korean, Japanese. This applies of course to both the client and the Store listing. Pay particular attention to the in-app shop and the currency symbols, if you offer micro-transactions. Games that have cinematics and\or voice-overs present particular challenges, as localization should be cover those as well. The same goes for the Store promo video. A common issue that can easily be overlooked, is verifying that the App Manifest does not contain any dangerous permissions that are not necessary. The ones that are must be requested within an appropriate time. This permission model has been introduced with Android 6 (Marshmallow) and has become increasingly important. Scrub any dangerous permissions which are not necessary from the App Manifest. If your app does require dangerous permissions, make sure the ones not critical to the app core functionality are requested when required by the app to use a specific feature. Those should not be requested during app launch. Pay particular attention to permissions added by any third party SDK integrated in the app. To maintain consistent user experience, the device Back button has certain guidelines in place. Issue Example: When the Back Button is accessed second time, instead of un-pausing the gameplay, it aborts the battle. In this case, the Back button should pause\un-pause gameplay, as a pause menu was available. • Pause and unpause gameplay. The app should return to a paused state after being minimised. After minimising the game, either via Home, Recent Apps, and/or locking the device, gameplay is not paused upon returning to the game. On screens where a Pause button is selectable, the player must return to the game in the Pause menu when navigating back to the game. The app should preserve user or app state when leaving the foreground and prevent accidental data loss due to state changes. 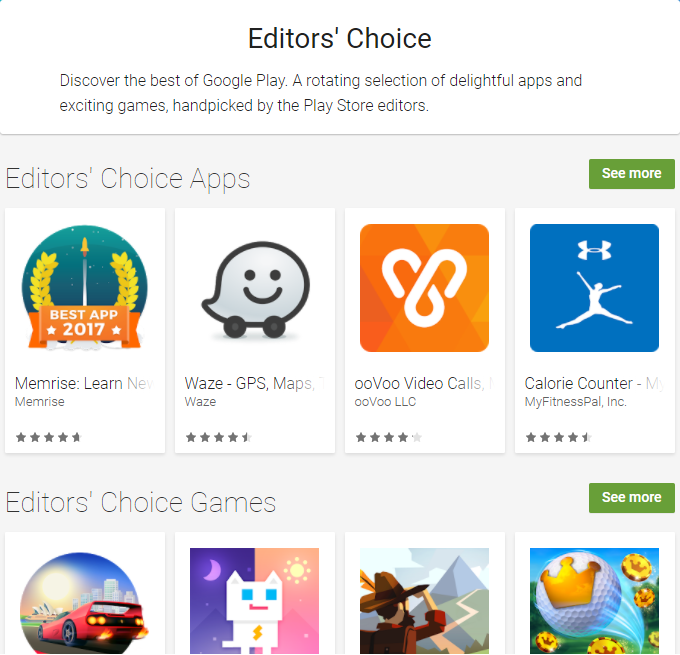 As Google is getting ready roll out Google Play Store and Android apps for the Chromebook, they are proactively ensuring compatibility as part of their feature review. At the moment, Android apps are available on select Chromebook devices with plans to expand to most available ones in the future, at which point it will likely become mandatory to ensure compatibility. Google prefers featuring content by main Store category\subcategory with a few additional custom ones (popularity, rating, ongoing contests or pre-registration). Regardless of which one of these you’re shooting for, tackling the best practices above will set you on the right track. Make sure your app has been properly tested for bugs. In-app purchases are a very important contributor of issues, so make sure they are properly scrubbed. Unable to purchase in-app products. This was an interesting case we encountered, as the in-app purchases weren’t functional in a specific scenario. We wanted to add a set of IAPs which were unlocked under special conditions. The approach we took ultimately led to this issue. Issue stemmed from the client requiring a Live Server Update before the IAPs were made available for purchase. This rendered regular sandbox purchase testing impossible without whitelisted accounts, which we provided to Apple. Apple tests in a production-like environment, not sandbox. Thus, the whitelisted accounts did not work for them. Resolving this required a lengthy communication with Apple review, explanations and videos. Always make sure Apple review can test in-app purchases. Even if they are functional in sandbox, consider the configuration Apple tests in. It’s always good to have videos\guides ready just in-case. Apple takes monetization techniques seriously, as well as App Store reviews and chart rankings. Engaging in practices that may directly\indirectly influence those, has a high risk of leading to a rejection. The app incentivises referrals in order to sign up new users. While many games use app invites to reach users, in our case we were providing both the invitation sender and the person receiving the invitation with a reward in-game. While rewarding the invitation sender with points or other digital content is acceptable, the person receiving the invitation should not receive any rewards for downloading or registering an account to use your app. While Apple does allow text and image overlays, screenshots should depict the app in-use as close as possible. Marketing screenshot(s) do not sufficiently reflect your app in use. You should resist temptation to over-produce Store assets. As Apple suggests, the app description, screenshots, and previews should accurately reflect the app’s core experience. While not every screenshot gets rejected, it is important to find the right balance\ratio of app content and produced content. Provide any review relevant information in the Review Notes section before submitting your app. If the review team can’t find something, they cannot test it. Particularly important are login information (if such is required to use the app), location of advertisements, steps to find in-app purchases which are not obvious. Missing explanatory steps on how to access 3rd party advertisement. Always prepare reproduction steps to reach Ads or an IAP, which cannot be located immediately. In situations where Ads/IAPs are more difficult to locate, or trigger under special conditions, prepare a video. The app is using an intermediary currency to purchase items that function as Non-Consumable products without having a mechanism that allows users to restore their purchases. Having a user progress restore mechanic in place that can restore progress along with content purchased via virtual currencies on the same or a separate device. This is generally a common practice among our games, however it can be easily overlooked for pre-HL releases. Again, similar to Google, Apple promotes newer devices through the use of guidelines. Their latest phone, the iPhone X, has already been announced to become mandatory starting April 2018 for new phone and universal apps. While it is unlikely Apple will request all app updates to be compatible with their new device, the benefits of doing so speak for themselves. 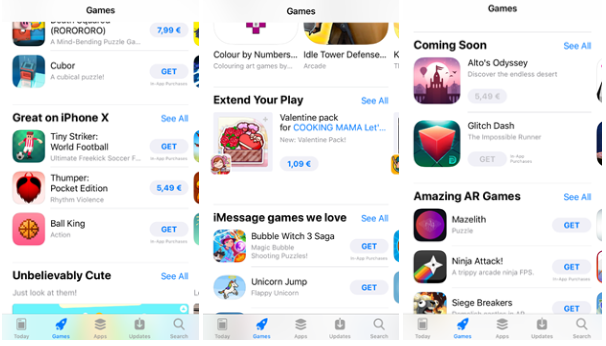 The iOS 11 App Store offers more opportunities to be featured in different categories, catering to different iOS capabilities: AR, Pre-Order, iPhone X, iMessage & Promoted IAPs being some of them. Whether or not you decide to add a certain feature, optimizing for a certain device or making use of a certain capability remains a strategic choice. However, as you instill your own vision into a game, it’s important to consider the guidelines representative to what the platform aims to offer. Those of course may change with new OS releases or other significant updates, but we should always adapt. As mentioned at the beginning, there are many factors which contribute to a successful review and getting featured in the Store and may differ from application to application. However, being compliant with the relevant guidelines is definitely one of them.